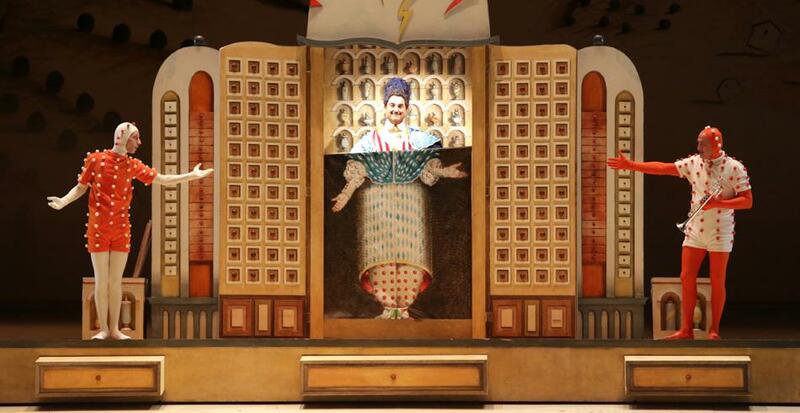 Tullio Pericoli’s designs for L’Elisir d’amore, currently at La Scala in Milan, recall the Osbert Lancaster sets for The Royal Ballet’s La fille mal gardée. Both men worked as illustrators for newspapers and their designs give the sensation of being inside a children’s book illustration. Franco Zeffirelli imitated the style for a production of La fille du regiment… it must be something about those French titles! The effect, surprisingly, isn’t twee but charming and warm-hearted, just right for the three pieces mentioned above, which lets us know from the beginning that all will live happily ever after. Equally true for all three titles is that casting is everything. With humour and irony at the fore, it’s not good enough just to sing the notes or dance the steps while wearing a costume: these characters must be played with careful judgement as it’s a fine line between being too much and vulgar, or too little and boring. La Scala’s cast for L’Elisir d’amore was almost spot on. The best of these were Michele Pertusi and Mattia Olivieri. Pertusi demonstrated superb comic timing as the quack doctor Dulcamara, and was suitably over-blown in gesture and his dress sense. Jan Pezzali as his assistant – a Woody Allen spermatozoa crossed with Marcel Marceau – was excellent and risked upstaging the entire cast. Young Olivieri, who was notable in La bohéme in August, once again showed off his fine acting skills as the sergeant Belcore. He’s ridiculously up himself with his exaggerated posturing and swaggering, and with the silly march as he enters with his platoon he recalls the policemen from Joseph Papp’s exhilarating 1980s production of The Pirates of Penzance. Less convincing on the acting front was Eleonora Buratto as Adina, but any lack of stage skills was more than compensated for by her vocal ones. She has an unforced rich timbre with a remarkable extension which takes her from true rounded lower notes – not that colourless belching that’s often heard – through an even middle range and up to a well-covered top. She has an easy coloratura, robust breath control and, (after a first act where almost everyone bellowed a little too much), was touching in her piani. I found her a pleasant stage presence though it would be good to see a little more sparkle. Brazilian tenor Atalla Ayan, who took over mid-run from Vittorio Grigolo as Nemorino, was the weaker link, but not weak to break the chain. He has a glorious voice and is ebullient on stage, but he tends to race ahead of the music, and although he tried to sing quietly a couple of times during Una furtiva lagrima, he reinforced the sound almost instantly, as though he was afraid of it escaping his control. Maybe it was La Scala début nerves. For all its masterful comedy, Il barbiere stems from a style and approach that takes matters of the heart for granted and wastes little times evoking them. 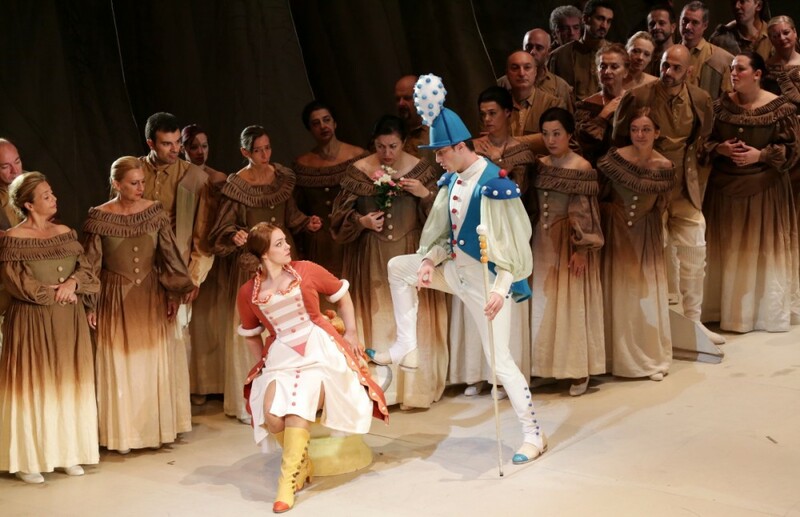 L’elisir, on the other hand, is a romantic opera buffa, wherein the conflict is ultimately resolved not through trickery or any outward circumstance, but through Adina’s coming to appreciate the true value of Nemorino’s constancy.